Fredericton, NB (April 16, 2014) – On April 27, 2014 the City of Fredericton is challenging businesses and residents to clean up Fredericton. Presented by Green Matters, the Crowne Plaza Fredericton and The New Hot 92.3, the third annual Clean up Fredericton event highlights the celebration of Earth Day in Fredericton. 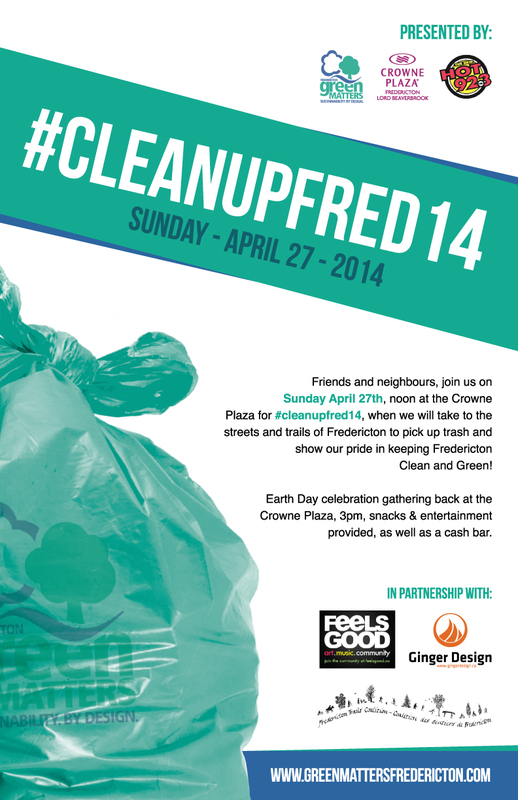 Clean up Fredericton began in 2012. The first year more than 70 participants took to the streets and trails of Fredericton to pick up litter. Last year the event grew to more 100 participants, including 20 children who took part in a garbage scavenger hunt. Clean up Fredericton also ties in with the City of Fredericton’s annual Spring Yard Cleanup Program campaign, which will be held this year from May 19-30. The clean up will start at noon on Sunday, April 27 from the Crowne Plaza Fredericton hotel. Organizers will assign clean up locations, review safety rules, and hand out bags and gloves. Participants will return to the hotel at 3 pm for a celebration party with music, food, beverages, and a few prizes. First held on April 22, 1970, United States Senator Gaylord Nelson founded Earth Day as an environmental teach-in. Earth Day has been celebrated ever since on April 22. The first Canadian Earth Day was held on Thursday, September 11, 1980. More than a billion people participate in activities in thousands of communities around the world in a celebration designed to inspire awareness and appreciation for the Earth’s natural environment. For more information on Earth Day 2014, visit their website at http://www.earthday.ca, use #cleanupfred to join the conversation on Twitter, visit the #cleanupfred14 Facebook page (https://www.facebook.com/events/1432986043603103/?ref=22 or log on to the Green Matters website: http://www.greenmattersfredericton.com.